This photo was taken in the third week in July 2012 at 2pm. The location was at my home in the living room in Bethesda, Maryland. The "Take It!" 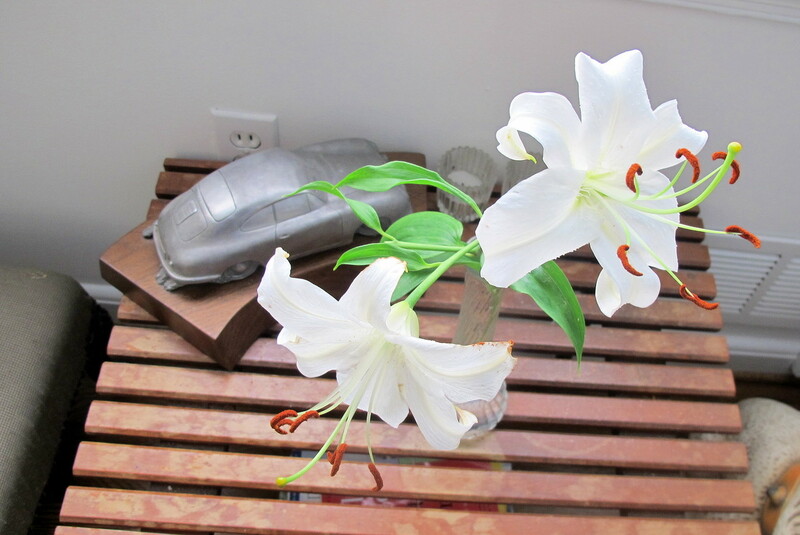 came from this set of Casa Blanca Lily's which were growing in the backyard that had such an amazing fragrance along with their beauty. 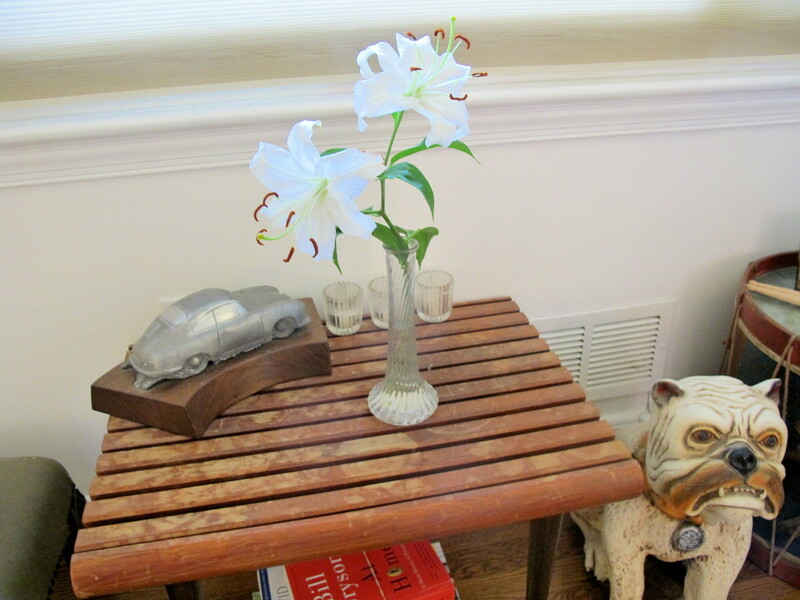 I enjoy seeing things in their original settings, but this was telling us that it was time to bring it into the house to be able to spend more time enjoying the fresh look of the flowers but also have its delightful aroma take over the room. The After Take: came from being able to walk into the living room at any time of day or night and enjoy the treat to one's sense of smell. The flowers themselves have strong personalities which made their contribution. The flowers were placed on a low table in the front of the room where votive candles are kept just in case of a power outage at night. The sculpture of the Porsche was made by my Brother Jeff, who is a very talented artist. For a number of years he made sculptures of famous vintage race cars. He sold them all over the world to race fans that wanted to display their dedication to the sport via this means. I am quite honored to be the custodian of this piece. Here is hoping you too will bring in or buy some flowers that have powerful fragrance along with their beauty to grace your home. Thanks for joining us for the current photo presentation. You are cordially invited to return Friday, September 21st for a new picture that we hope you will enjoy. Is that a vintage toy car, or just a model? Looks very cool. I don't think your dog statue enjoys having his picture taken. Those flowers are in full bloom. I have some very similar in my front yard; however they rarely bloom to that magnitude.